Chapter 1 (continued) - What Divide? 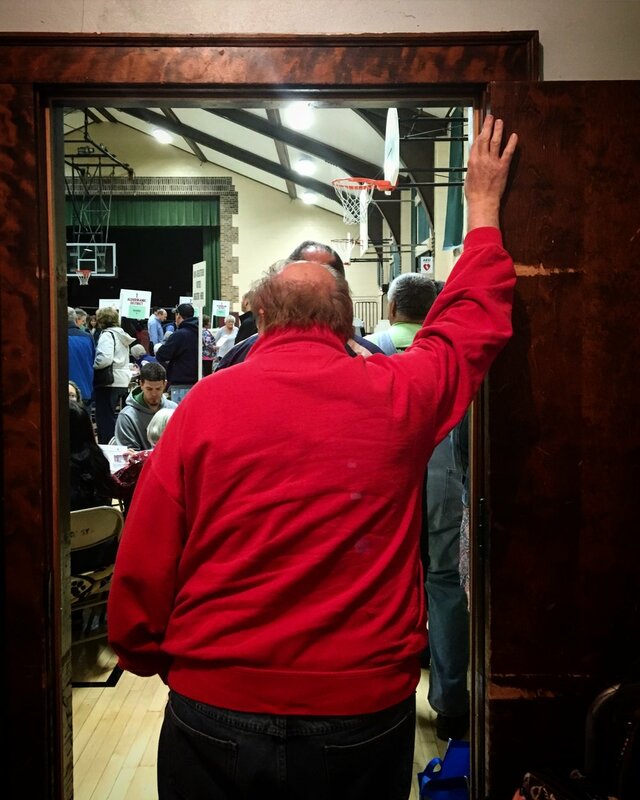 An obscured view from a gymnasium closet inspired me to sharpen my focus on my community. On November 8, 2016, Kathryn and I met at home after a long day of teaching, and made our way to the Cedarburg Community Center to vote in the presidential election. Cedarburg is relatively active when it comes to voting, but this was the first time we saw the line overflow out of the building into the crisp autumn night. When we finally made it in through the doorway I was struck by the sweet smell of cold sweat mixed with elegant old lady perfume. There were work boots and business suits and the tension of the event was palpable. It took us quite a while (as it always does in the district 1 line) to snake around the old gymnasium. At a certain point I was re-acquainted with the smells of my elementary school days - we found ourselves waiting in a gym closet next to racks of basketballs and kickballs and I found myself growing nostalgic for the Kennedy-era fitness drills we were doing in the early 90’s -remember the shuttle run? It wasn’t until were were out in the open, in full view of the District 1 check-in table that I began to wonder what kind of a community I was living in. I wondered if those Allen Edmonds shoes were representative of a lifestyle out of touch with the needs of a social safety net; or, if that mother with her three kids hanging over her cared about the fact that we have always only had men in the President’s office? This environment seemed to kick my liberal arts style of inquiry into gear, and I wondered and questioned silently throughout my slow shuffle over the scuffed gym floor. All that went away when I faced the familiar faces of the retirees performing their civic duty with gusto. It’s not quite TSA, but checking in and proving your identity is always taken very seriously. We know how things went that night. We know about the Inauguration and the Women’s March, and a strange two years of tweets, and an evolving Supreme Court, and the growing influence of late night clowns. I know Cedarburg is a homogenous community in regards to race and ethnicity, but this was my first time viewing the breakdown visually. It’s striking. It also conjures questions about how this impacts our community. Plus, it causes me to wonder what this looks like in reference to the city of Milwaukee? Below is a map that shows the concentrations of voting in the 2016 Presidential election. The contrast between the city of Milwaukee and its surrounding communities makes me wonder if the lack of racial and ethnic diversity has much to do with how we vote? I plan to dig in deeper into this topic in upcoming posts.